Favors are something that you give to your guests as a "Thank You" for celebrating your wedding with you. Now the question is how much should you spend on favors and what kind of favors should you give? For my Italian themed, black-tie formal wedding I really want to give my guests something special, but also meaningful, without breaking the bank or my budget. Now, I really can't answer this question for everyone, because to some budget really isn't an issue, while others are on a more firm budget where favors at $5 a piece is out of the question. Originally Morgan and I had discussed on donating money to a charity in all of our guests' names, but I'm wondering if this is feasible, seeing as we are almost at 190 guests...so much for having a small, intimate wedding huh? Oh well, I guess that's what happens when you know too many people. 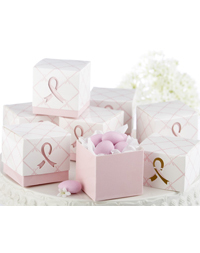 ﻿﻿ With the pink ribbon favor boxes, we can still donate to the Young Survival Coalition in honor of Breast Cancer Awareness month which is October without breaking the bank :) Then we can put M&Ms in the boxes, not to be cheesy, in honor of Morgan and Morgan. It is important to both Morgan and I that we give something back to the community and we would love to be able to show our support for breast cancer awareness and research by making one of these a favor for our wedding guests. They are all unique, charitable and not too expensive. But we are going to keep our options open and see if donating is still an option, but maybe we will do both...who knows! It is a great cause and I know that many people, including Morgan's mom, will be truly touched by this gesture.